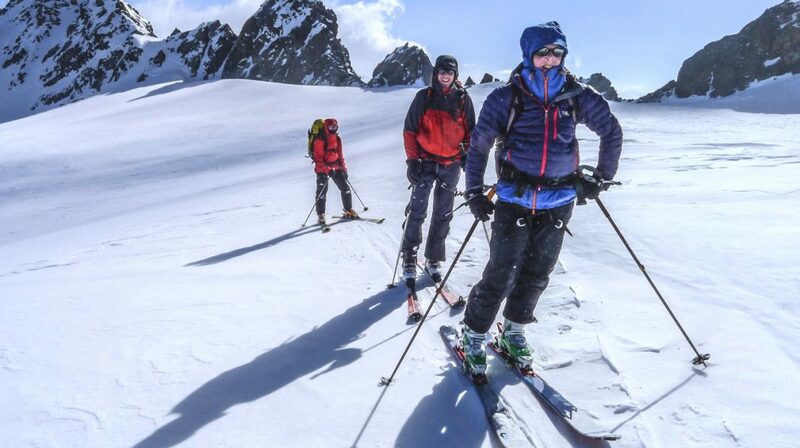 Chamonix Ski Touring Course - full instruction with experienced UIAGM IFMGA Mountain Guides. If you dream of leaving the crowds behind and exploring the backcountry, then our ski touring course in Chamonix is for you! For keen skiers with some off piste experience, this course delivers the skills and knowledge for travelling safely through the mountains in winter. You will learn how to skin and kick-turn efficiently, how to avoid avalanche terrain and use essential safety equipment, plus many more important ski touring skills. 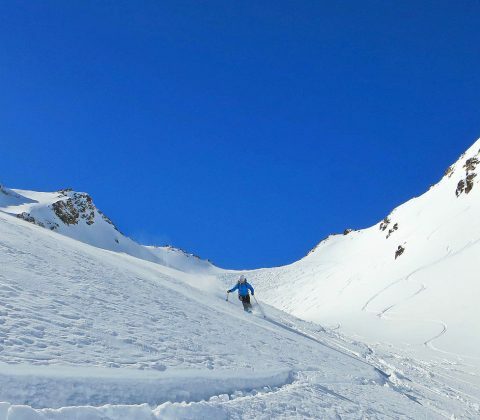 This is the ideal course to kick off your ski touring career, or as preparation for a classic ski tour such as the Haute Route. Free safety equipment rental is included with this course. We had an excellent time and it was a great introduction to ski touring. It’s given us plenty to think about in terms of planning for next year ! I think everyone is fairly keen to do more. Thanks once again for all the help and advice in the run up to the trip. We had an fantastic week. Neil really pushed our level – I felt like a different skier by the end, changing my survival-style skiing to controlled descents of steep gullies and putting in equal-s turns on powder. The Val di Rhêmes trip was pretty special. In Argentiere we all had a real laugh, the rooms were good and the hotel staff were very pleasant. All in all it was a great trip! Thanks to everyone. My trip away with Alpine Guides was truly brilliant. Gav was exceptionally patient with everyone and had a really lovely manner when guiding us and ‘teaching’ us skills we’d never done before. We were extremely fortunate with the weather so I have come away with some stunning photos that remind me of my amazing experience. The trip was amazing thanks. Gav was a great guide, and would recommend him/Alpine Guides to anyone that’s thinking of doing the course. The thing that stands out the most was how towards the end of the trip he stepped back and let us plan the days/routes and just let us get on with it. He was super knowledgeable, and made me feel at ease even when skiing on glaciers and using crampons for the 1st time. The hotel was great and so was the location. The itinerary was perfect, especially on the last 2 days… we were all smiling from ear to ear, and were speechless with the run back down. I can’t wait to get back out! A great week, learnt loads. Gav was very good, hit the right balance between teaching and doing the tours, very conscientious and good company. I liked the way we progressed through the week, culminating in a superb final day. I did thank Gav personally but please pass on my thanks again. 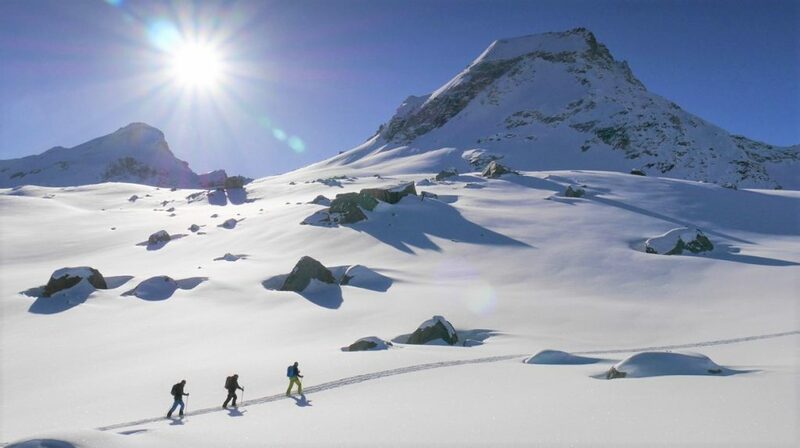 On the ski touring course we teach a full range of techniques for traveling efficiently through alpine terrain, including important areas such as route planning, avalanche avoidance, tranceiver training and glacier travel. Tips and coaching to improve your off piste skiing are also an important part of the week. Teaching and training sessions are always incorporated into ‘real’ days out ski touring each day, in order to give you the maximum range of experience and a fun weeks skiing! As this is a ski touring course, you will also spend a night in a high mountain hut in order to experience a longer, overnight tour and a taste of Alpine hut life. This is an to introductory level trip. To take part you should be at Fitness Level 2 and Tech Level 2 (see our Fitness/Experience guidelines). 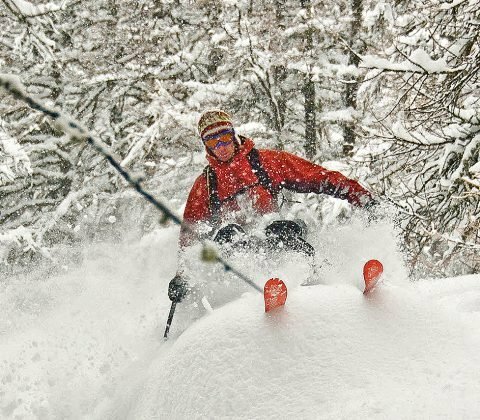 You need to be a regular off piste skier, but no previous ski touring experience necessary. This is the minimum requirement and teams of mixed ability/fitness are quite common, but the pace and scope for each day is determined by teaching objectives rather than a time critical journey, ie things are usually quite relaxed! For our overnight in the high mountains we will use a mountain hut. This is usually one of the popular and spectacular Mont Blanc massif huts, or in the neighbouring Aosta valley. For more info please read the Using Alpine Huts article which provides an overview of typical facilities, average costs to help you budget for lunches/drinks, and general info on hut etiquette. You should arrange outward travel on Sunday, arriving by 6-7pm latest in time for the briefing at your accommodation. Your guide will run through kit checks and safety routines, as well as hand out any rental equipment, before going on to discuss the current weather and mountain conditions and how these affect our plans. We’ll have maps and guidebooks of the area to show you, so if you’ve any further questions or last minute requests, then this is the ideal time to bring them up. On day one, we start with some warm up runs and an introduction to ski touring kit, before practicing skinning skills and doing some avalanche tranceiver training, then we set off on a lift assisted day tour. We’ll choose a tour appropriate to the level of the group, so that nobody struggles and everyone has the time to learn new skills and ask questions etc en route. You’ll need to bring a packed lunch, as we’ll be out in the backcountry all day, enjoying the skiing and scenery. The technique is to slide your skis along the snow in smooth strides – ie don’t lift them up off the ground with each step – it’s more of a ‘shuffle’ than a ‘walk’. Your lower boot buckles need to be snug in order to prevent heel lift, whereas the upper buckles need to be loose in order to allow maximum ankle flex. Putting in a good skinning track is also quite an art and needs to take account of the terrain, as well as dangers such as avalanche risk. The normal way to ascend a slope is in a series of zig zags, in order to maintain a comfortable track angle. There are different spacing protocols for travelling on terrain such as glaciers and steeper slopes, in order to reduce the loading on the slope – so it’s important you know how and when to spread out within a group. All of the above skills are best practiced ‘on the hill’, so we plan appropriate routes each day, that keep up with your learning curve and allow time to fit in skills sessions along the way. Careful pre route planning is essential for any ski tour or backcountry outing, whether a single day trip or a multi day hut to hut tour. The latest weather and avalanche reports must be obtained and understood in order to plan a safe route and find good snow. This is the aspect of ski touring that many people under estimate, but it’s more important than even your ski ability – as the best way to ensure a safe days skiing is through thorough planning. We’ll show you how and where to find information and make informed decisions for tour planning, as well as go through the process of selecting routes from maps and guidebooks. We also look at group dynamics and planning strategies for making good safety decisions on the hill. During the day, good navigation skills and careful observation of current conditions and terrain are equally important if you are going to follow your planned route, or decide to change it in light of conditions. In addition to map and compass work, we look at other important navigational aids for skiers including altimeters and GPS. This is an area that we look at constantly throughout the course, both at a planning level and during each day out – on the way up and on the way down. Carrying the right kit is equally important, so we’ll show you what you need to carry on your harness and in your rucsac, how to set up a ‘cowstail’ and what types and lengths of rope to carry. Needless to say, we’ll also teach you how to use it all! It’s important to know how to conduct a safe descent, including the need for extra caution and control on glaciated terrain. In poor visibility or heavily crevassed terrain, you may even need to ski roped up – this is something you definitely need to practice before trying it for real. Hopefully, if you’ve been paying attention and skiing safely on a glacier, then you won’t end up in a crevasse. However, if the worst does happen, then knowing how to rescue a team member is an essential safety skill. Being prepared with the right kit (including wearing a harness with a ‘cowstail’ already attached) is an important part of your glacier skiing setup. We’ll teach you how to build a reliable snow belay using skis, then rope up and prepare the edge of a crevasse before hauling out a victim. For those with more ropework experience, additional sessions on prussicking and haul systems can also be included if appropriate. There’s a lot more to it than simply doing a transceiver search – knowing how to protect the rescuers, coordinate a group search, divide up jobs, do a final pin point search, probe for the victim and finally, undertake a coordinated conveyer belt dig out are all essential skills needed to cut the rescue time down to 15 minutes. Tours during the week are planned to involve as wide a variety of terrain as possible, including glaciers. We spend at least one night in a high mountain hut to complete a longer 2 day tour. Tips and coaching to improve your off piste skiing are also an important part of the course. Fri PM – course debrief and advice for the future. Final night in the Couronne.